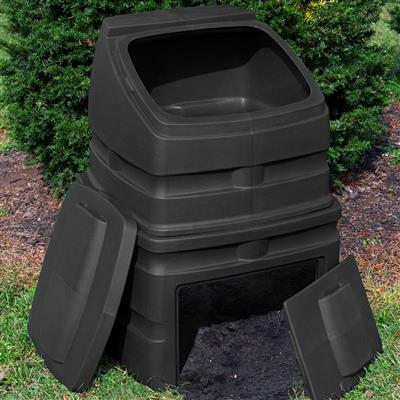 This popular tumbler type composter is made of durable 100% recycled polyethylene and holds up to 12 cubic feet of compost. Black color absorbs heat for fast composting while the the tumbler easily rotates to mix compost. Composting is a very personal thing, and lots of people do it lots of different ways. If you like a system that's already put together for you and is simple to use, this is your tool! We liked the first one so much that we got a second one too. Very easy assembly - because no assembly required. Couldn't keep the compost wet enough when leaves were added to the kitchen scraps because the numerous air holes dried out the compost. Had to remember to sprinkle water several times a day. Can't figure out how to nicely plug up some of the air holes. Very easy to screw on the large lid. Easy to tumble but leaked lots of compost tea out the side holes and the closed lid while turning - messy. Have had this for 6 months and went back to using my homemade upright trash can composter. 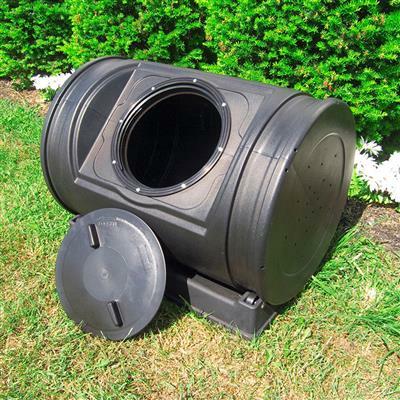 This compost tumbler does create compost extremely fast, especially during the summers here in vegas. 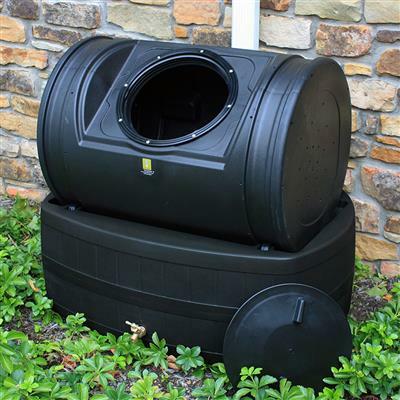 I can pull 20 gallons of fully finished compost out of this thing every 1-2 weeks. The major down side is that they didn't make the wheels large enough on the base, so when the barrel gets up to about 50-75% full, it'll bow enough in the middle to the point where it scrapes against the base. This makes it extremely difficult to turn, especially as I add more material and it gets heavier. 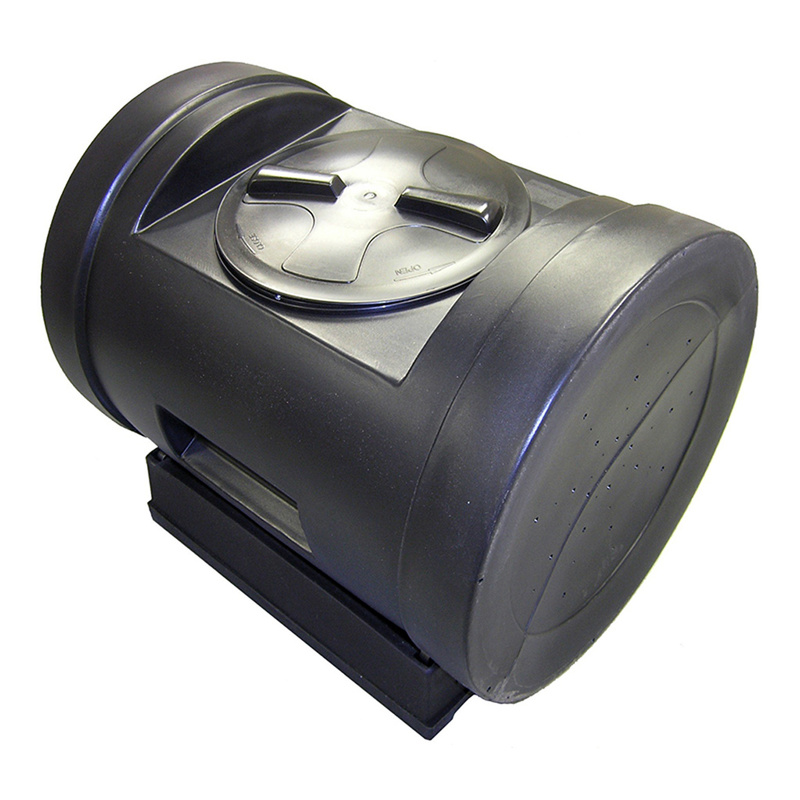 If they redesigned the base and added larger wheels, or maybe made the barrel of a stronger plastic so it didn't bow as much, then this tumbler would be much better. Seems to work ok. Would prefer baffles on edges between compartments but does okay. The lid or opening doesn't set down quite 'flush' like I'd like it; seems like the machining on the plastic threads wasn't quite perfect or something. But, it does work. I guess that's the important thing.I like the black, and the turning of the cylinder seems to work okay. Overall, hey, a good product as far as I know. Easy to move, easy to use. Have had it for less than 2 weeks, so no compost yet, but we're on our way!